I don’t sleep much on planes but feel more energized than usual by the conversations we had with this group of dedicated people who support the health needs of people who sometimes live 5-6 hours away from their primary hospital. It was exciting to see VGo through their eyes: Can we help patients who are in isolation while in the hospital because their immune system is so compromised? How can we facilitate physician contact with a patient who is home after surgery when the hospital is a plane ride away? Can a family use VGo for a visit to help a nurse explain the condition of a grandfather who is in rehab? How can VGo help a specialist who needs to make a first assessment for a patient who lives 3 hours away? In each of these situations, what was seen as most important was NOT the technology we offer, frames per second, cloud computing, or imbedded 4G. 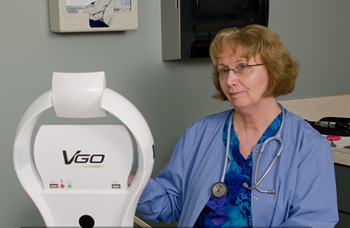 Clinicians told us that VGo works because it connects them with patients and their families in an interactive way. They talked about the importance of simplicity, flexibility, speed and portability. And that what is most important to them is providing great patient care, reducing costs and unproductive travel time, creating revenue from remote consultations, and making the best use of scarce capital funds. I’m grateful to be working with VGo when our healthcare system is looking for new ways to deliver care, and am excited to hear that we can help in many ways.